The Democratic Peoples’ Republic of Korea (DPRK) or North Korea succeeded in placing a 100 kg Earth Observation (EO) satellite Kwangmyongsong-4 into a Sun Synchronous Orbit (SSO) on February 7, 2016. As it had done in earlier launches, the DPRK used its Unha-3 launch vehicle for the latest mission. The launch was conducted from the Sohae Space Center in Ch’o’lsan County, North Pyongyang Province. 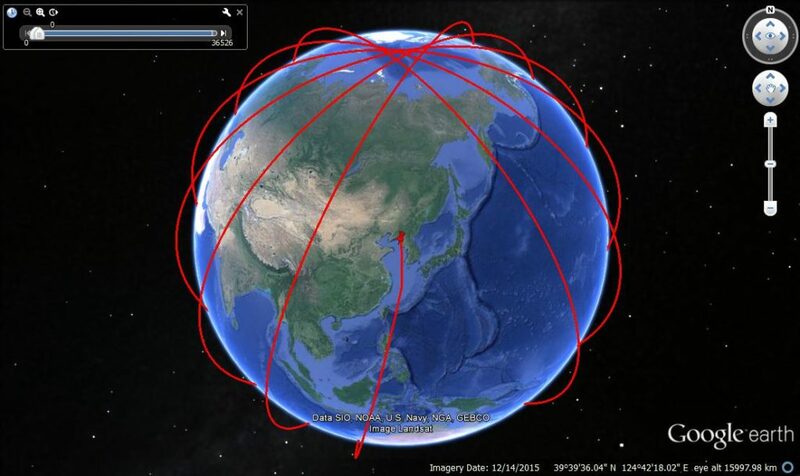 North Korea has so far conducted six space launches. The last two launches conducted in December 2012 and the recent February 2016 launch have been successful in placing small remote sensing satellites into “more difficult to reach” sun synchronous orbits. Based on available information put out by various agencies including official North Korean sources this report attempts to reconstruct the trajectory of the February 2016 launch. Using this reconstruction of the trajectory it goes on to make inferences about the technical parameters of the launcher. It builds upon and complements an earlier study carried out by the ISSSP on North Korea’s successful launch of 2012 to provide an update on North Korea’s launch and space capabilities. On February 2, 2016, the North Koreans had released information about an impending space launch to the International Maritime Organisation (IMO). The statement indicated a launch window stretching from February 8 to February 25, 2016. It also provided the area coordinates or impact zones for the spent stages and the shroud. 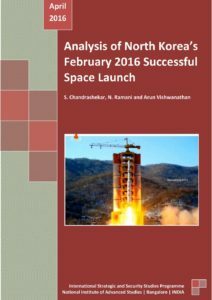 On February 6, 2016, the DPRK narrowed down the launch window to February 7-14. The launch took place on February 7, 2016, the first day of the revised launch window. The analysis was carried out using the Quo Vadis trajectory software developed at the National Institute of Advanced Studies (NIAS), Bangalore. Using an iterative trial and error process involving changes in the various launch vehicle parameters very similar to those used in our analysis of the 2012 launch we attempted to arrive at a trajectory in which the impact points of the first stage, second stage and shroud are closely matched with the nominal impact points put out by North Korea. Along with this we also introduced needed maneuvers to the first, second and third stages for realizing an orbit that matched well with the NORAD orbital data. With two successful satellite launches, North Korea has indicated its capability to indigenously design, develop, test and integrate advanced technologies like a new engine for its launch vehicle. More importantly, the two launches have highlighted the North Korean capability to bring together the hard technologies with the softer parts of the launch like mission planning and management. For placing the satellite into a sun synchronous orbit, North Korea has to carry out maneuvers after liftoff, pitch down the second stage after the first stage separation and also carry out a yaw maneuver of the third stage before injection of the satellite into orbit. Successful mastery of these difficult technologies and a complex mission indicates the progress in rocket and missile technology that the North Koreans have achieved since their first failed launch in April 2012. The launch trajectory and the initial orbits of the February 2016 launch of the Unha-3 as computed by the Quo Vadis software is depicted in Figure below. North Korea conducted four nuclear tests with the latest test in January 2016. In addition it has successfully put a satellite into orbit twice – in December 2012 and February 2016. With these capabilities, North Korea is moving towards the capability to miniaturize its nuclear warhead and delivering them on long range missiles. Though the Unha-3 is primarily designed for a space mission, it can be modified into a long range ballistic missile. Trajectory analysis using the NIAS trajectory modelling software – Quo Vadis – shows that a due North East launch (25o azimuth) of the Unha from a suitable location with a 1000kg payload (sufficient to carry a nuclear warhead) can reach all of Alaska and some parts of northern Canada. As indicated in an earlier ISSSP, NIAS report, if North Korea manages to reduce the payload mass to 800kg it will be able to successfully deliver a nuclear warhead on parts of western coast of the continental United States including the states of Washington, Oregon and northern parts of California. Figure below provides a visual representation of the range of the Unha 3 launcher if it is deployed as a long range missile.